I adore this photo, yesterday we took the kids ice skating, I sat on the side lines with the youngest eating candy floss whilst watching the older three getting to grips with being on the ice. 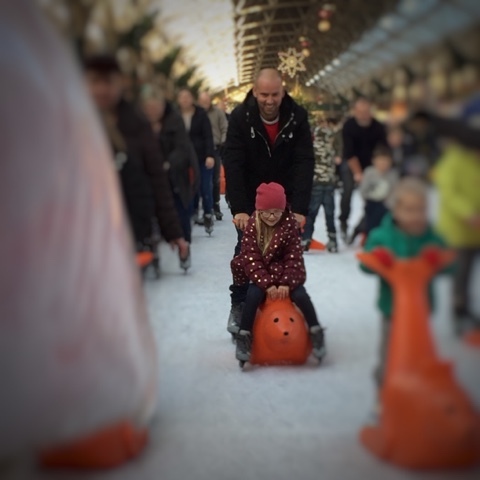 My 6 year old just couldn't get the hang of it so ended up being pushed around on this contraption by her dad, now Gracie is a proper daddy's girl so you know she really enjoyed herself. My husband doesn't really like having his photo taken so ones like these that are candid really are a rarity and ones to cherish. This photograph to me just screams pure joy and a wonderful moment shared between father and daughter. What a gorgeous photo! You can see how happy they both are. Great photo, they look so happy. This just screams Christmas! My kids are desperate to go ice skating, such a fun thing to do at this time of year. A gorgeous capture.